I recently had a surprise baby shower and was really touched by the thoughtful gifts that my friends gave...so I only felt that I send a heart felt thanks by creating some hand made Thank You cards. Here are a few that I have for sale at my shops! These cards are crafted on embellished 4 x 5 periwinkle note cards with scalloped edges. On the back I added a white blank paper to add your personal message. Each cards come with their own white envelope. These are really sweet and simple notes of thanks to send to anyone! I had some flatbacks sitting in my box for almost a year and couldn't figure out what or how to to use them. Well after a visit to a local bead store I found some findings, particularly a silver uniquely shaped finding. 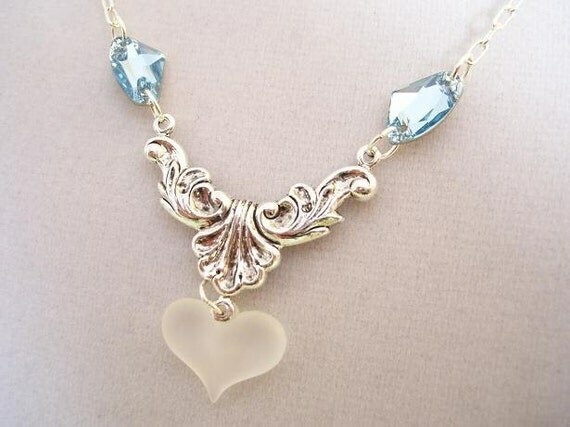 I had a charm that I was using for a bracelet but opted to attach it and the flatbacks to a silver chain and clear beads and what I created I named: Crystal Blue Ice Queen Necklace! I was pretty impressed with how it turned out...and I hope you are too! This is too sweet to let get away, so if you're looking to accessorize your outfit for an upcoming event or give as a valentines gift...why not pick this! I also had some glass tiles that I wanted to use so rummaging thru my stack of paper I found this brightly colored sheet that had some nice blues, yellow & pink...added a silver bail and attached it to a silver chain and VOILA! 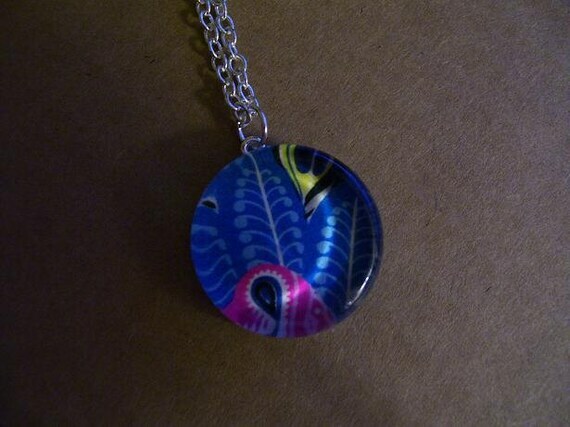 Here is a bright and fun pendant that I called Bright Paisley...also nice little gift to give this Valentines! Now make sure to visit either one of my shops to get 15% off your purchase! Just enter coupon code: 15OFF at checkout.